When temperatures push 90 and even 100 degrees, cooling off with The Crisp and Jammer seems like the norm, and we do reach for these lighter styles pretty often in the heat. It makes sense right? The bitter snap from noble hops in The Crisp, and Jammer’s light tartness helps to make these brews über crushable. But there are other options. For some, dark beer is pushed aside in the warm months, often times because of a common misconception equating dark beer to heavy, over-filling beer (which has been indoctrinated for years by TV ads). However, the bitter roastiness of a stout can be similarly thirst-quenching – the dry finish of a craft stout, like Otis, makes it a refreshing and flavorful brew that is quite easy to drink. This prevailing problem of the ‘dark beer is too heavy’ myth is mainly a perception issue; the degree to which malt is roasted largely determines a beer’s color. Which is to say that a beer can have tons of lightly toasted malt, be thick, full and high in alcohol and still be golden, while another can have just a small percentage of highly kilned malt and be dark in color but light in body. Beyond that, think about backyard BBQ, or grilling in the park. 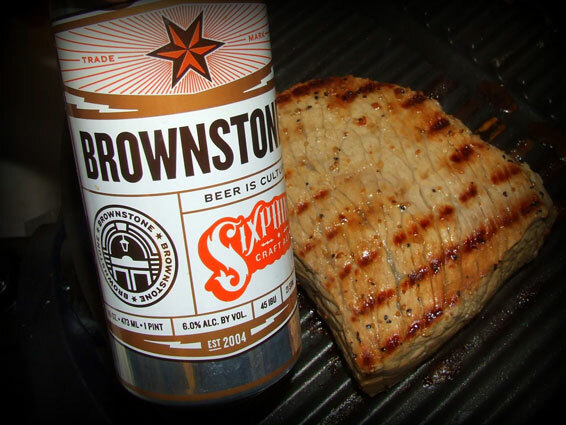 While a lighter beer can wash down some grilled chicken and burgers, a beer with roasted malt can complement the roasted elements in the food with some amazing results. (Don’t get us started on how good a smoky brew, like MS #14, the Gratzer, is at a bbq— that’s a conversation for another day.) A bold black beer is also sturdy enough to stand up to a porterhouse or some ribs, whereas a lighter beer might fade into the background. So yes, please enjoy the bite of The Crisp on the hot days, but don’t miss out on the luxurious (and refreshing!) flavors a dark brew can bring just because a short-sighted drinking buddy told you that dark beer was too heavy.